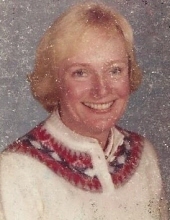 Crooked Billet Elementary School Teacher retiring in 1996. Did research and illustrations for her self publish book "Reflections of Hatboro"
To send flowers or a remembrance gift to the family of Sharyn Clark McGuigan, please visit our Tribute Store. "Email Address" would like to share the life celebration of Sharyn Clark McGuigan. Click on the "link" to go to share a favorite memory or leave a condolence message for the family.